The funeral for Marine Lance Corporal Matthew Snyder was held in Maryland, but word of the private funeral made it to Rev. Fred Phelps, Sr., the Westboro pastor, and he and his group traveled to Maryland to protest. The protesters say soldiers dying is God’s way of punishing the United States’ tolerance of homosexuality. The Fourth Circuit later threw out the verdict on First Amendment grounds. Though the Court said the remarks were “utterly distasteful,” they held that they were not actual assertions of facts about the family (which could be libelous), and that they involved matters of public concern (gays in the military, homosexuality, American morals, etc.). This is one of those speech cases that is really difficult to address from a legal standpoint. Phelps and his followers follow all the rules — they stay the requisite distance away and get the proper gathering permits. In other words, they make sure to break no local laws. But one can only imagine the trauma they put Snyder and other similar families through, especially considering that their anti-gay protests have a tangential link, at best, to the issues surrounding the wars in Iraq and Afghanistan. As Adam Liptak at The New York Times noted, the Court will have to address whether its 1988 decision barring of Jerry Falwell from suing Hustler for intentional infliction of emotional distress applies in this case as well. One of the arguments that Snyder advances is that that standard should not apply in a disagreement between two private individuals. In other words, Snyder is giving the Court an opportunity to uphold Falwell but give private individuals recourse in this sort of situation. The Supreme Court will not take up the case until the fall, which gives all of us some time to try and figure out how this one should fall. The emotional answer is immediate, but the legal answer is much more murky. Or maybe it’s not at all, and we just have to accept what we’ve all been told (that which is trite but true) since we first learned about the First Amendment. It sometimes means hearing the worst of all speech and understanding that freedom does have its costs. As always, the infallible SCOTUSblog has full coverage of the case, including the petition for cert. 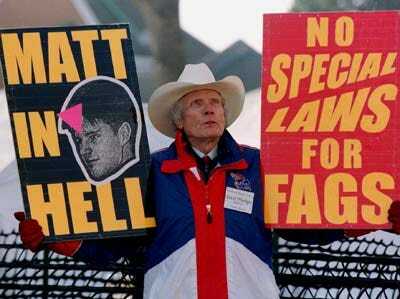 UPDATE: Margie Phelps, the attorney representing Fred Phelps and the Westboro Baptist Church in this matter contacted us and said that the “Matt In Hell” sign was not present at the funeral of Matthew Snyder. That sign refers to Matthew Shepherd, as noted in the picture’s caption. The Snyder petition for cert (p. 7) states that the “Matt in Hell” sign was present; Phelps disputes that in the respondents’ opposition brief (p. 4). Both, as noted above, are available at SCOTUSblog.